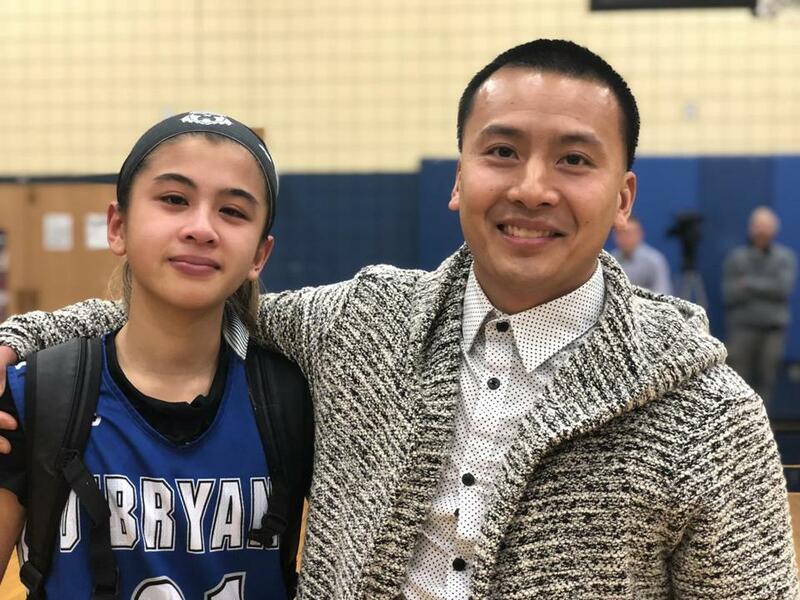 O’Bryant guard Christina Pham (left) with her uncle, Vinh Bui, the girls’ basketball coach at New Mission, before Friday’s Boston City League matchup. Vinh Bui and Christina Pham are inseparable. On Friday night, the two were on opposite sides, uncle and niece. Bui is in his first year as the girls’ basketball coach at New Mission. Pham, a seventh grader, plays on the varsity for Boston City League rival O’Bryant. The game was but a tiny snippet of their time together. Their relationship spans far beyond the game. “I don’t really have a father figure, so he’s like my father figure, my coach and my trainer,” said Pham, who lives with her mother, Trisha. A basketball trainer by trade, Bui said his flexible schedule allows him to stay close with Pham. Not only do they train on the court, but Bui takes Pham – a straight A student – to book stores and libraries to do homework among other activities. The game, a 70-47 New Mission win, was circled on their calendars for a long time. At 12, Pham has grown up fast. Her maturity and confidence are evident. Their tough love relationship is even clearer. Before this season, Bui was an assistant for both the boys’ and girls’ teams at New Mission after a stint as an assistant with the boys’ team at the Boston Latin School. He has helped a number of young student-athletes find their footing. Celio Araujo used to train with Bui. Now a senior guard at the University of Maine, Araujo said Bui is integral to the Boston basketball scene. “Vin has been one of the biggest agents for change in the Boston community,” Araujo said. “He’s a basketball junkie and has always done everything simply for his love of the game and desire to help those in underprivileged communities.